WEEKEND PREVIEW: Storm to Face Blaze in Back-to-Back Games! Tickets for Storm’s upcoming game against the Coventry Blaze can be ordered online HERE, or by calling the Box Office on 0161 926 8782, or in person at the box office. Face-off is 20th January, 17:30 face-off. Let’s pack the barn as Storm look to defend the Patton Conference. What a brilliant few weeks it has been for the Manchester Storm. Wednesday saw our televised Patton Conference clash against visitors, Guildford Flames via FreeSports. Storm came out strong, winning the game 3-2 – with goals from Byers, Braid and Long! COVENTRY BLAZE V MANCHESTER STORM – SATURDAY 19TH JANUARY, 19:00 FACE-OFF, COVENTRY SKYDOME. Both Patton Conference teams will face each other twice this weekend in double-header EIHL clash, as the Storm boys travel over to Coventry Skydome on Saturday 19th January. After some thrilling wins lately, the Storm will be pushing for a road win. If you won’t be making the trip to support your team, you can purchase the Coventry Blaze webcast here. 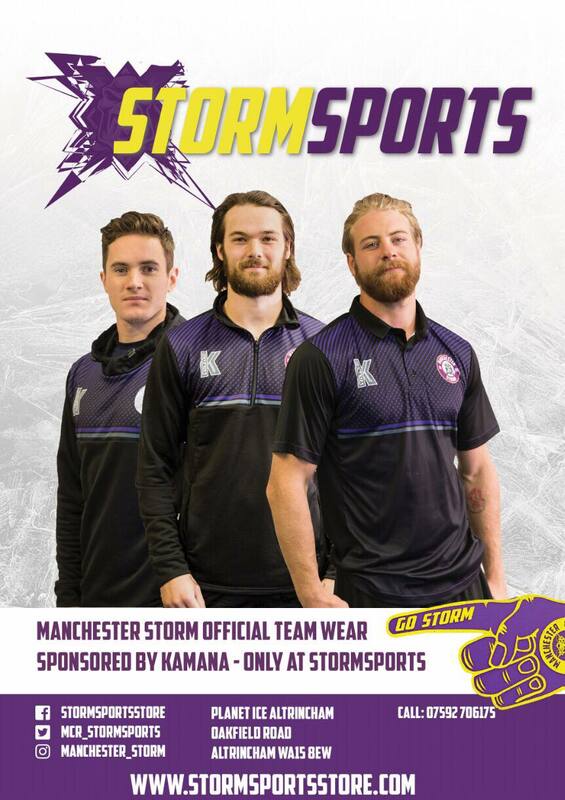 MANCHESTER STORM V COVENTRY BLAZE – SUNDAY 20TH JANUARY, 17:30 FACE-OFF, PLANET ICE ALTRINCHAM. The Storm are now on an eight point streak at home, and will be doing all they can to make it ten this Sunday against visitors and Patton Conference rivals, Coventry Blaze. There are now just seven points between 4th and 10th place in the league. The remainder of the season sees the league’s eleven teams fighting for a top eight spot, in the push for playoffs. The Blaze are currently on a par with Storm in the EIHL table, with 37 points – yet have played three less games than the Storm. Last week GB head coach, Pete Russell announced his 26 man squad ahead of exhibition game against Dinamo Riga. Blaze forward, Ben Lake has been selected for the first time, joining Blaze defenceman, Luke Ferrara. Following this weekend’s game, the next home game for Storm falls on Sunday 27th January against the Sheffield Steelers, 17:30 face-off. The OSC’s next event takes place in just a few days – January 22nd, 19:00PM. Email [email protected] for more information! The supporters club have a few upcoming events; from ladies night to Bowling with the Storm. Go and check their social media out!